Bad Weather cannot stop you from exercising any more. 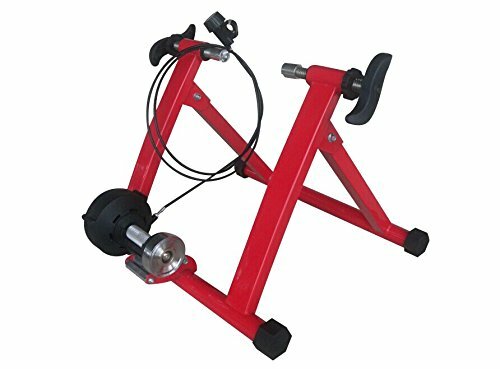 This beautiful red magnetic resistance trainer converts your bike into an indoor cycling trainer. It offers effective indoor training in a stiff, well supported frame with little noise - at a reasonable cost. This Trainer is easy to set up with almost any bike--including road and mountain bikes with a 24"-28" or 700c wheel. Fine-tune to your wheel and tire size with the micro-adjust knob. As you pedal the internal magnet creates resistance, with 5 levels of resistance. And you can change them right from your handle bars. Its compact size takes no space. If you have any questions about this product by BestValueDeals, contact us by completing and submitting the form below. If you are looking for a specif part number, please include it with your message.